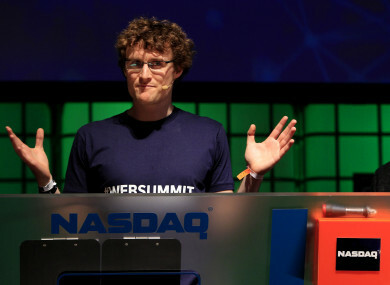 WEB SUMMIT ORGANISER Paddy Cosgrave has apologised after Portugal’s Prime Minister criticised him for holding an “offensive” summit dinner at Lisbon’s National Pantheon, where a number of the country’s important national figures are buried. The dinner was held last Friday at the National Pantheon for founders and investors of the Web Summit. Prime Minister António Costa, who opened the Summit, said the decision to host the dinner at the Pantheon was “unworthy of the respect due” to the national monument. Costa said that although it was legal to do so, it was the fault of the previous Portuguese government for allowing the “offensive use of this monument”. Laws will be amended to prevent the Pantheon from being used for similar events in the future, according to Costa. The Pantheon is a former church, the Church of Santa Engrácia, and was converted into the monument in 1966. Portuguese national heroes buried at the site include the first elected leader Manuel Arriaga, a number of former presidents, writers and poets such as João de Deus and footballer Eusébio. Following the criticism, Cosgrave apologised for any offence caused. “Dear Portugal, I apologise. I’m Irish. Culturally we have a very different approach to death. We celebrate it,” Cosgrave wrote on Twitter. A Web Summit statement said that it was “trying to honour the history of Portugal and have our guests appreciate the storied past of this country”. When the Web Summit was based in Dublin, the Founders’ dinner was hosted in the crypt of Christ Church Cathedral. Email “Web Summit organiser apologises over 'offensive' dinner at Portugal's National Pantheon”. Feedback on “Web Summit organiser apologises over 'offensive' dinner at Portugal's National Pantheon”.